I believe that the RUMBLE by Roto Grip will pleasantly surprise many - that is, if it isn't mistakenly overlooked. It's a brand new release in its sector -- the HP-2 Line of the Roto Grip arsenal - and, believe me, it would be a huge mistake if it ever got lost in the shuffle or got hidden in the glamor of other new releases. 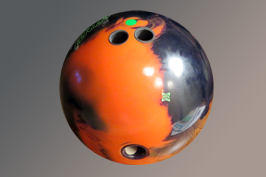 Though built around similarly named guts as the SCREAM and SHOUT, within a first few shots the RUMBLE makes it obvious that its Late Roll 51™ core is a welcome new creation in the Roto Grip line. On almost any lane surface, it performs with a strong roll on that would be better described as anything but "late." I have not found it at all sluggish about getting into a strong heavy roll. Yet it's in no way accurate to think that this is just another early rolling ball that will burn up its energy and arrive at the pins dead on arrival! My RUMBLE is drilled with the pin above the center of my bridge and the CG about an inch right of the center line of my grip (Pin to CG distance is about 3.5"). Typically for me this is a layout that stores up a little extra energy, creating easy length with a little extra pop down lane --- usually a good house shot layout for me and that's what I was aiming for with the RUMBLE. What I was surprised by was the almost immediate and heavy roll that the RUMBLE got into off my hand without compromising any of those other performance factors. In fact, what the RUMBLE did utterly impressed me. Expecting next to nothing, I first practiced with the RUMBLE out of the box (2000 grit abralon) on the 2013 InsideBowling.com Open (29ml, 44 ft, 2.31 to 1 ratio) in the same center which hosted the IB Open. To my surprise, the supposedly low-end performance capacity RUMBLE not only didn't shy away from the volume or length of the pattern but made a consistent effort against the volume and a solid move at the end of the pattern through the pins that made me wish I had it in my hand when I bowled the IB Open last April! It gave me tug room and allowed me to line up with mistake room target-left on that pattern which the DISTURBED had not allowed me to do and it didn't seem to sacrifice one bit of hitting power or continuation in the process. On a pattern of that length and substantial volume, I was impressed. My second outing with the RUMBLE was on a hooking house shot at a recent Land of Lincoln doubles tourney in Springfield, IL at King Pin Lanes. I had applied a moderate coat of polish over the box finish of the 55™ coverstock. During practice I went through several guesses of what would work best from my arsenal, including the WRECKER and a polished CRITICAL THEORY, and the RUMBLE won the day. With the same strong rolling performance off my hand that I had seen from it in practice, what was most impressive about the RUMBLE in this instance was that I could tug it into the volume in the middle of the lane and it would hold its own and move without loss of traction through the pins and I could also leak it into the dry and it would react in a nice even arc without sparking through the face. This is the performance facet of the RUMBLE that I find most intriguing! Even attacking the dry, when most other bowlers were going through the face on mistakes to the right, on shots that I was certain were going to be a sure big-four the RUMBLE just smooth arced its way into the pocket for a strike or at least a pickable four pin. What I haven't yet had chance to do is to test the RUMBLE on a number of flatter sport patterns, but my intuition is that the RUMBLE is going to be much more valuable in my arsenal than its seemingly unimportant place in the HP-2 sector of the Roto Grip arsenal would seem to suggest. That makes it all the more potential bang for the buck at its extremely reasonable price point! 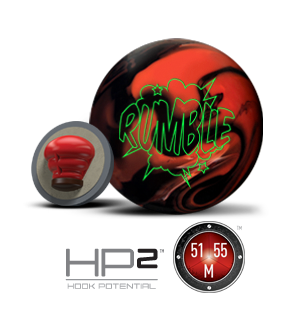 For those who are exclusively league bowlers, I gotta tell you the RUMBLE may have just become my favorite house shot ball on the market! Try one!